This section gives examples of other stuff, such as posters and business cards etc..
Where foiling is used please refer to the foil sheet list on the page "card and bespoke stuff." Posters at A3 are £4 and A4 £2. 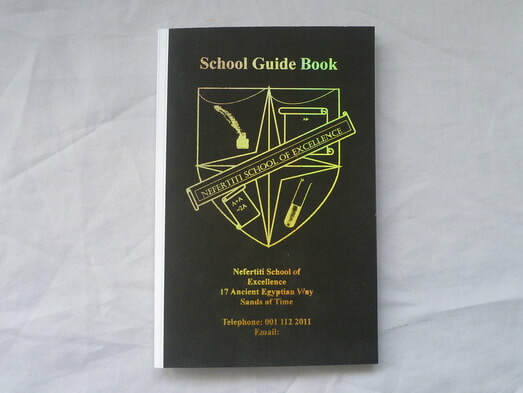 A perfect bound book for a school. Some schools put the children's work in them as a project. The work might be pictures, poems and stories. The books are then printed and given one to each child. Some schools them sell them. Other have books with student information in. Books can also be stitch bound. AnA3 business poster using hologram Gold and Cracked Glass Silver. This poster gets noticed the play of the light on the hologram foils causes it to seem to just off the page. A3poster using hologram gold. This was done to advertise a rock band. This poster was A4, using hologram gold and patterned red on light ivory card. It was made for a pub. 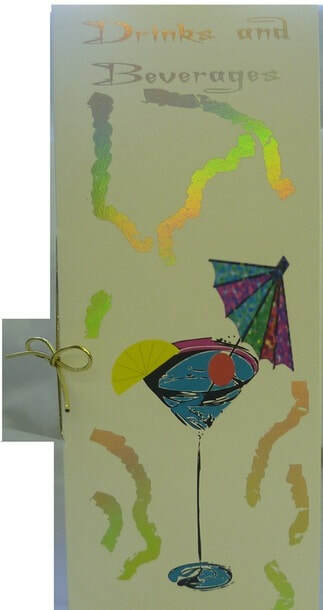 Compliment Slip using hologram patterned blue foil on thin card. Compliment Slip using hologram patterned red foil on thin card. 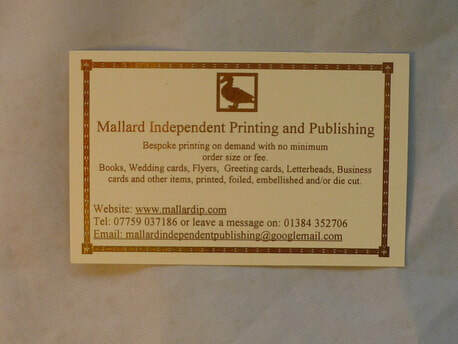 A business card on 240 gsm ivory card, using bronze metallic foil. A business card on 240 gsm light blue card, using silver and black metallic foil. A business card on 240 gsm ivory card using metallic silver foil. A business card on 240 gsm ivory card, using multi colour hologram foil. Drinks list. Hologram gold on ivory card. The insert is tied-in using cord. This allows for the insert to be easily changed. Drinks list. Hologram cracked glass silver on white card. 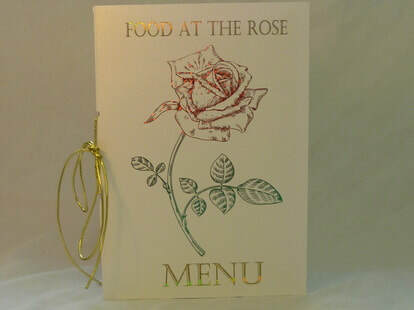 Menu Hologram red patterned and metallic gold and silver foil on black printed card. The insert is tied-in using cord. This allows for the insert to be easily changed. Menu. 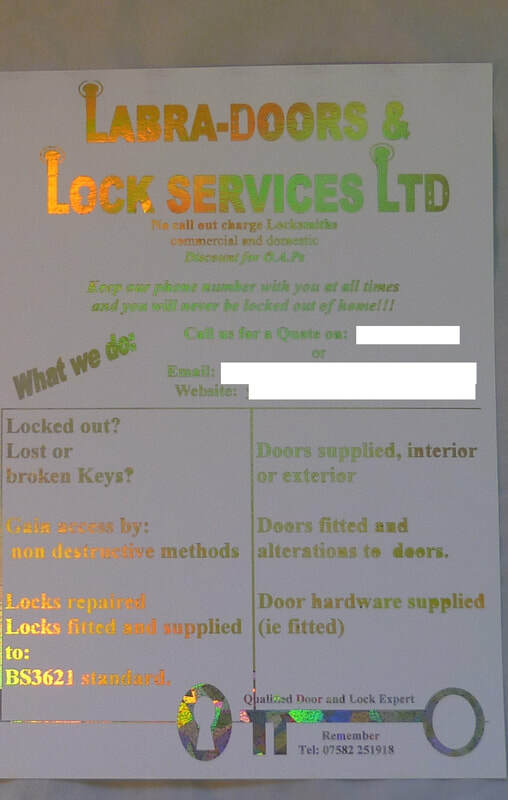 Metallic gold, red and green on white card. The cord holds the insert making it easy to replace the inserted menu. Reserved sign. Metallic gold on red card. Table numbers. Pretty, cheap and easy to replace.